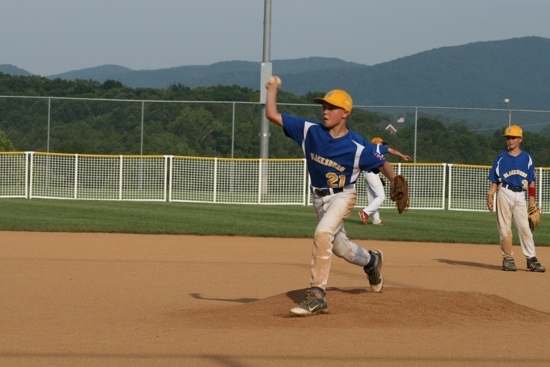 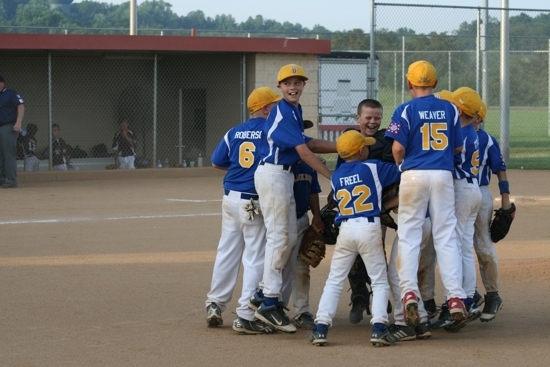 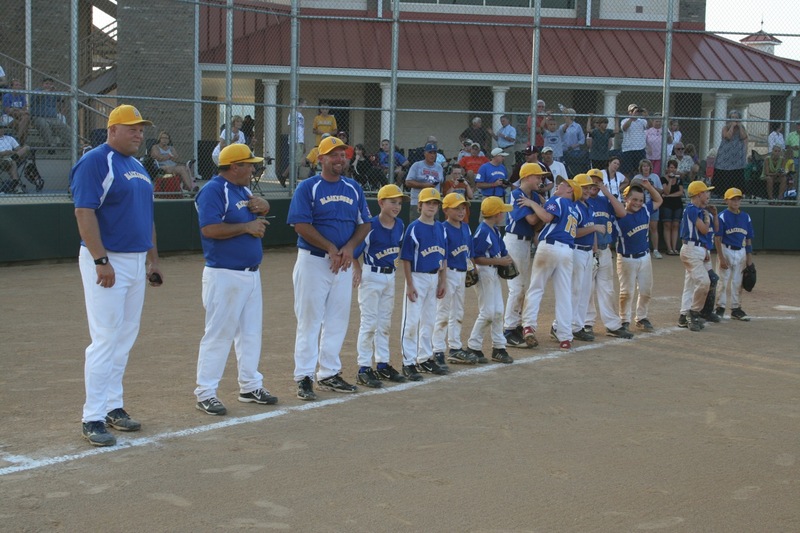 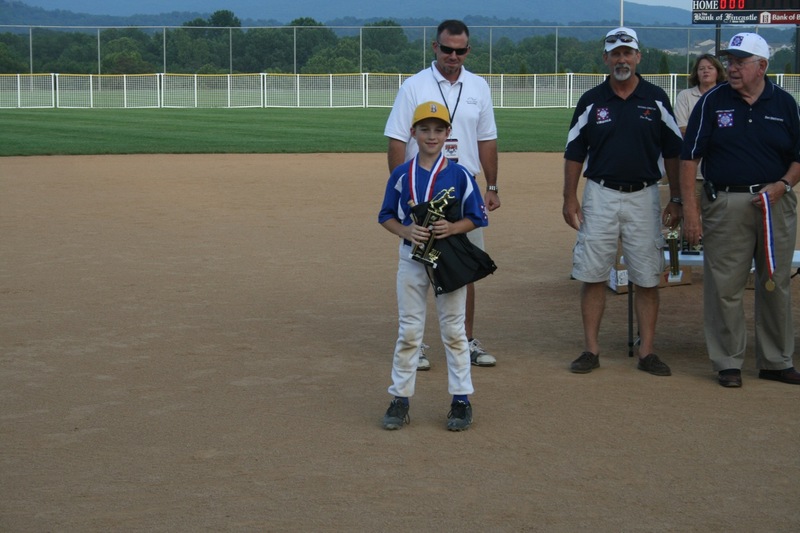 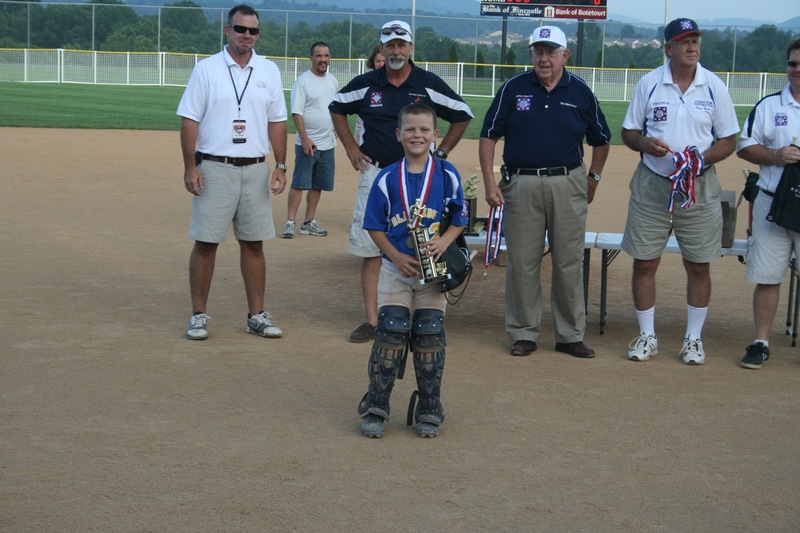 The Blacksburg Minors won the Virginia State Dixie Championship on Thursday, beating Botetourt 18-0 in three innings via the 15 run slaughter rule. Blacksburg was clearly the more rested and prepared team, as Botetourt appeared out of gas and made uncharacteristic errors. 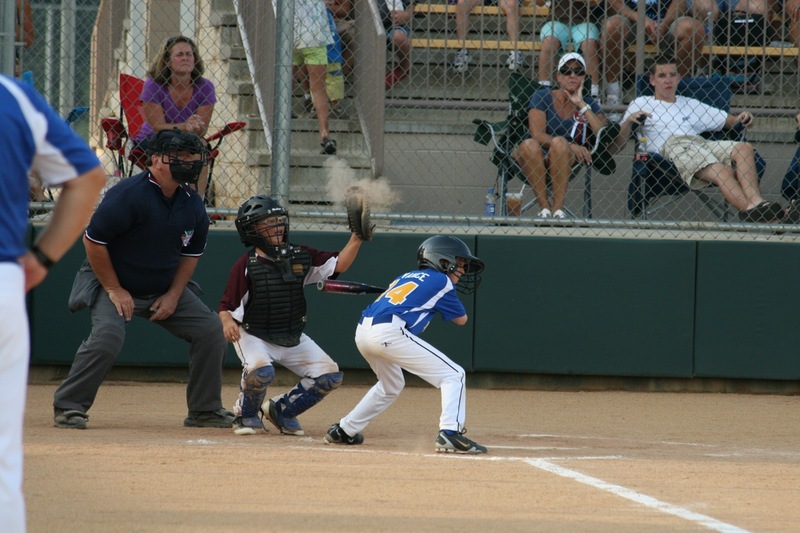 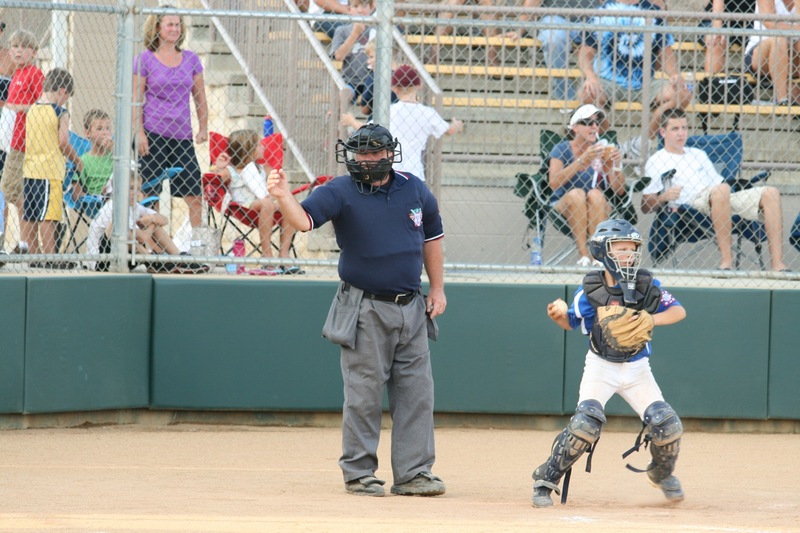 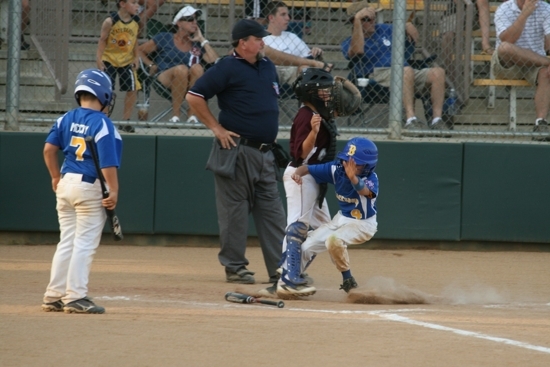 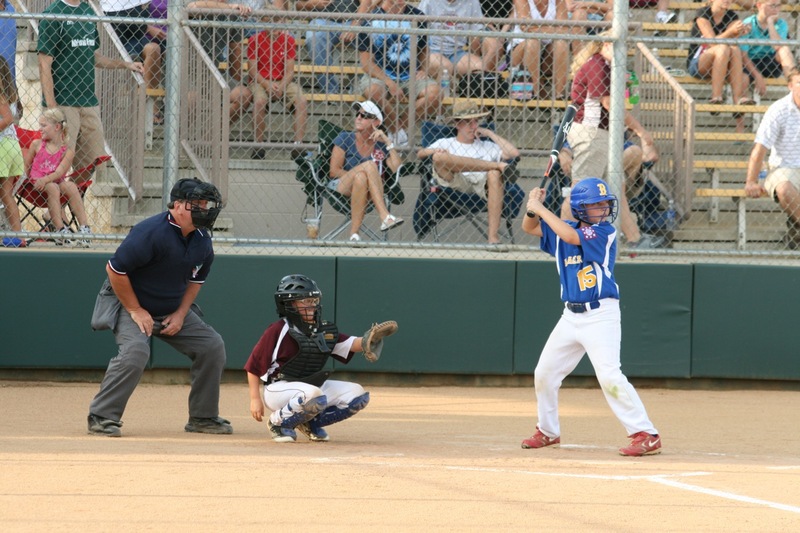 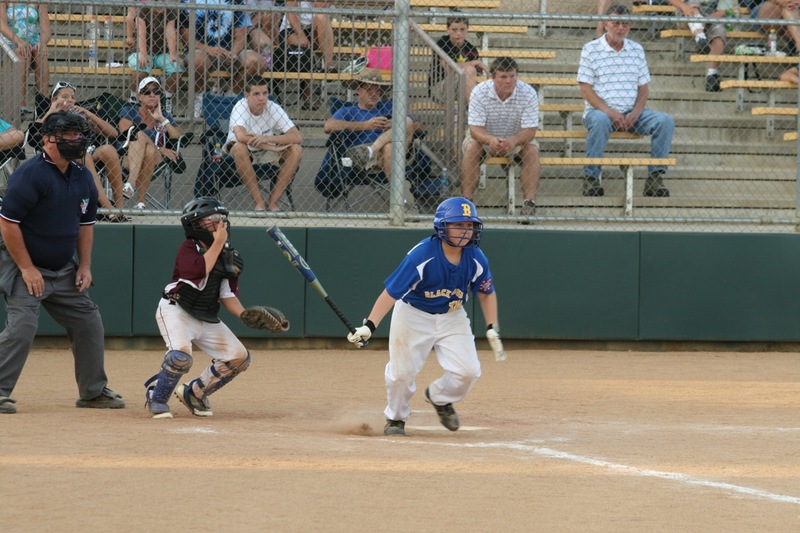 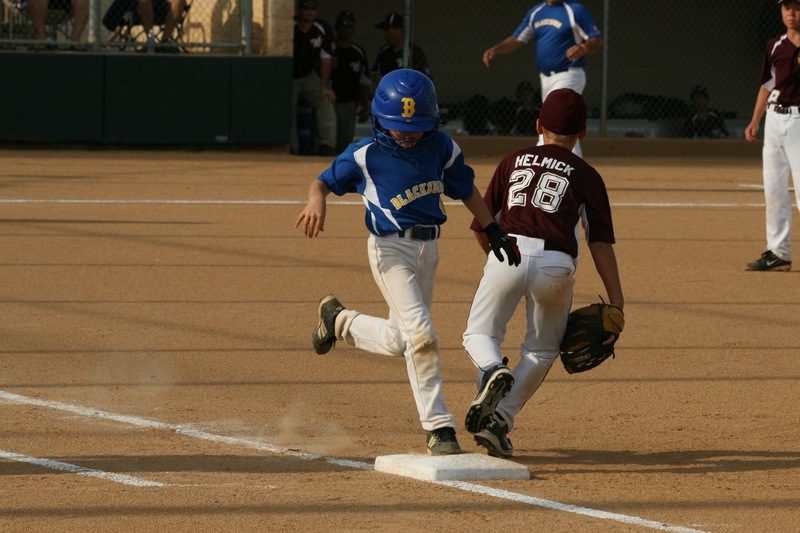 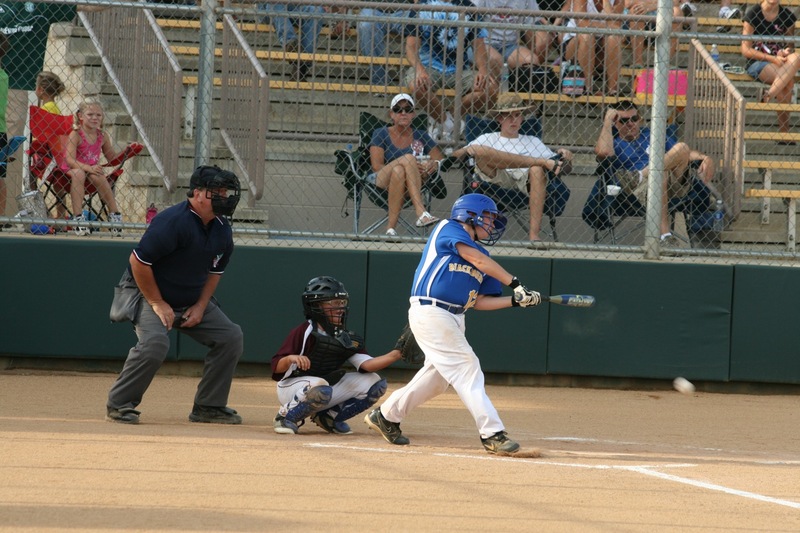 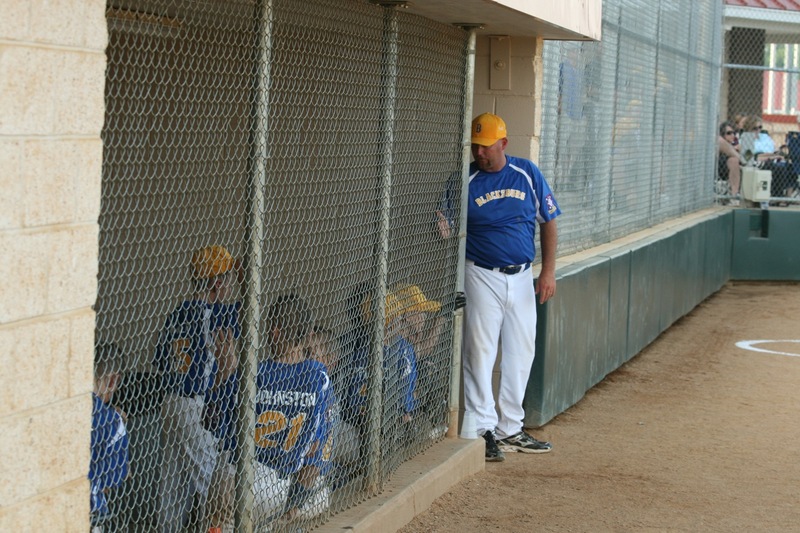 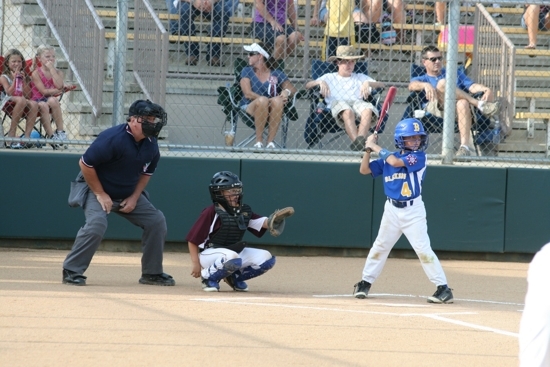 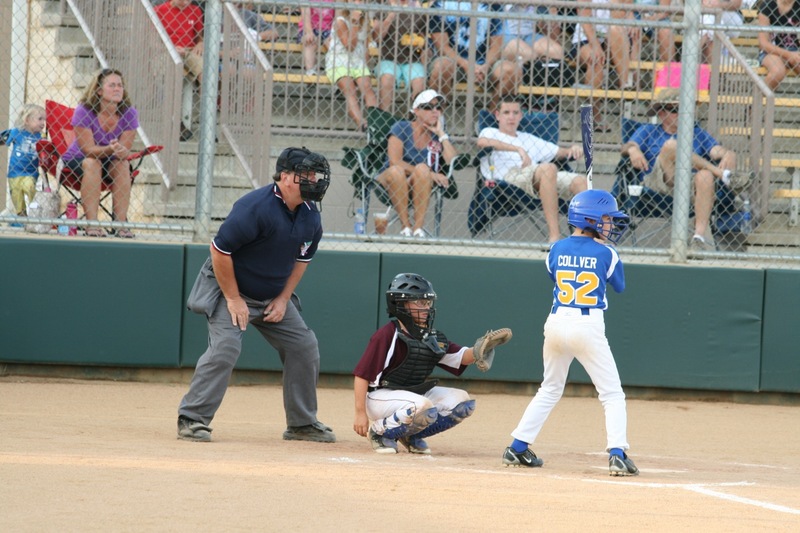 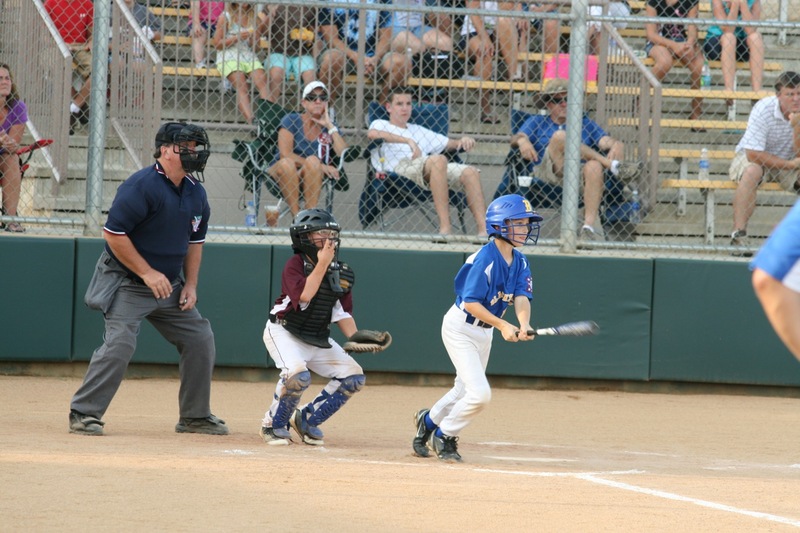 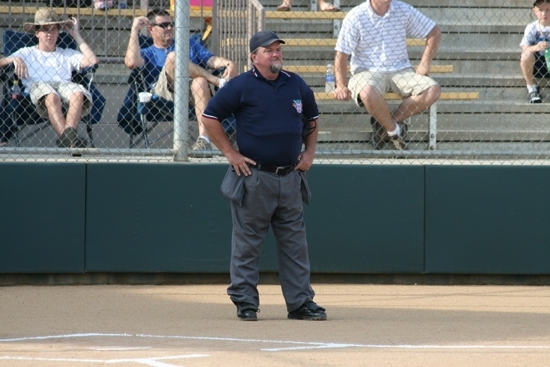 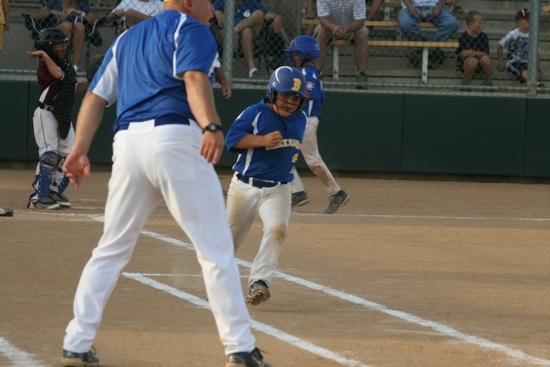 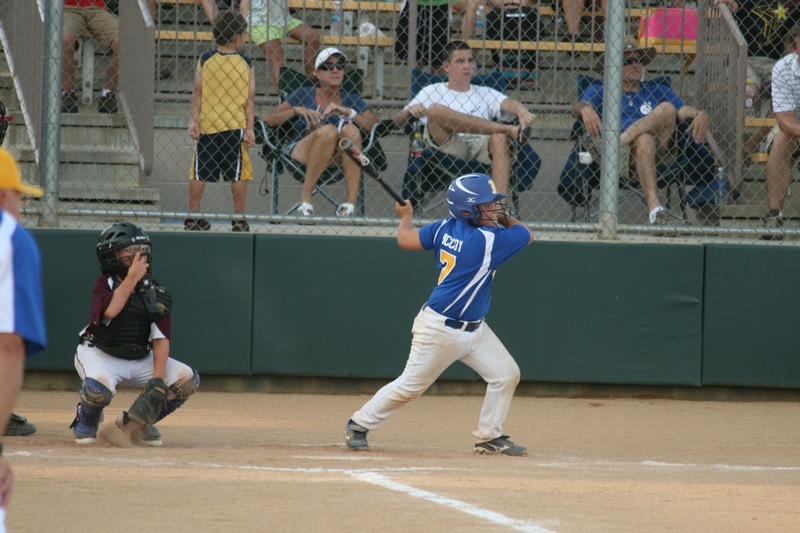 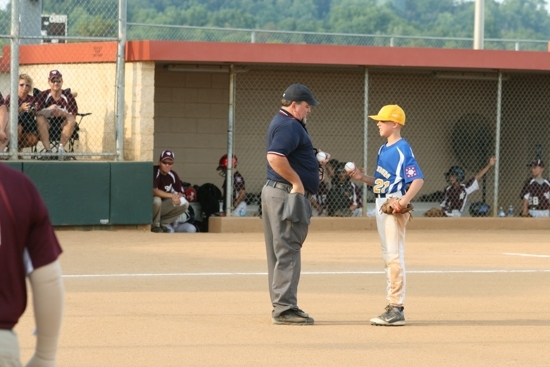 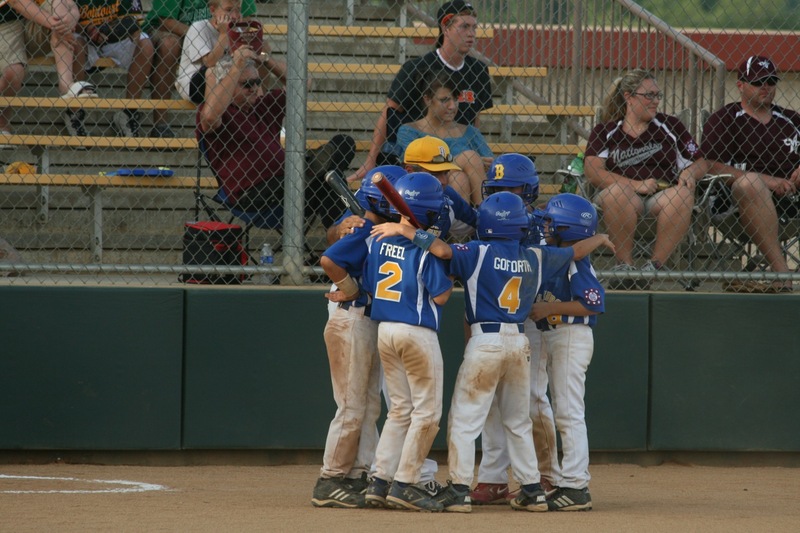 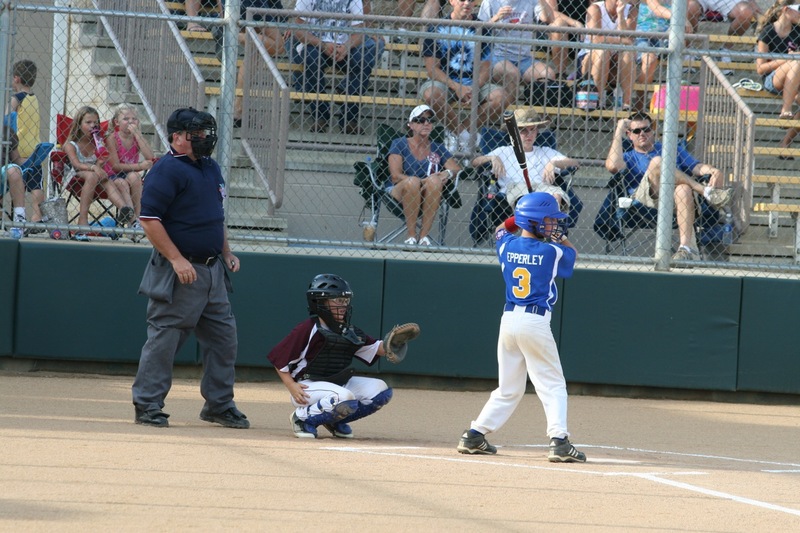 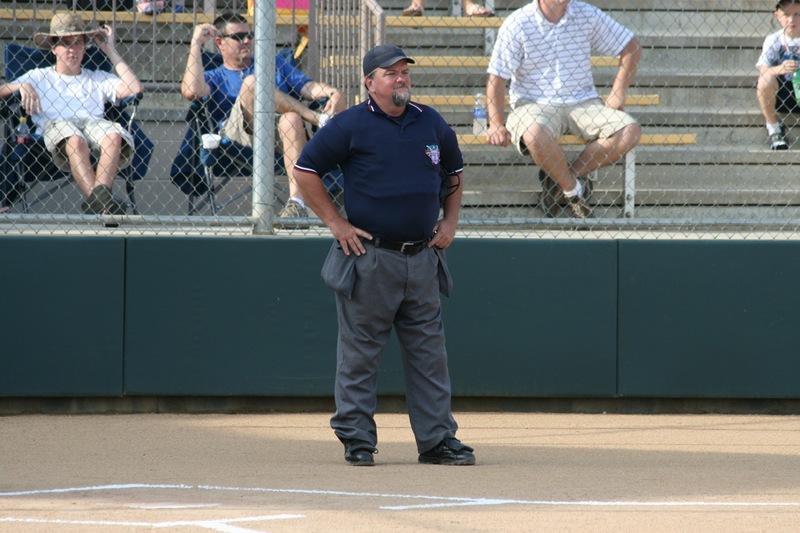 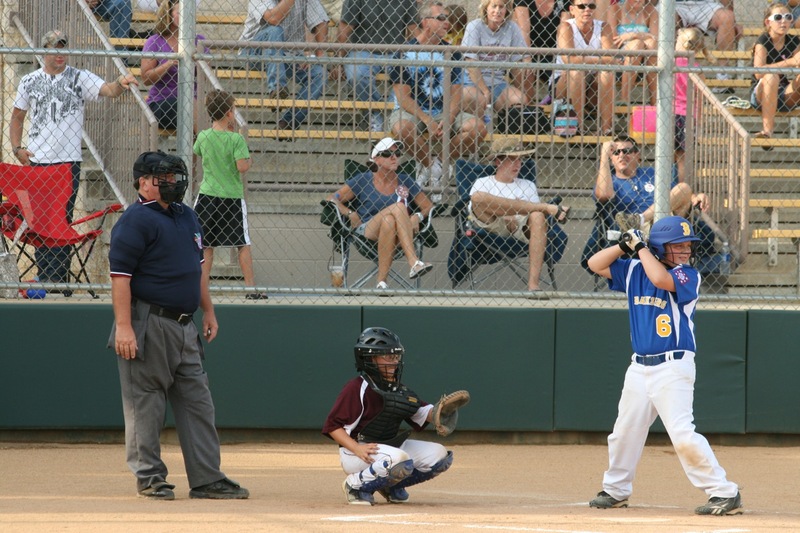 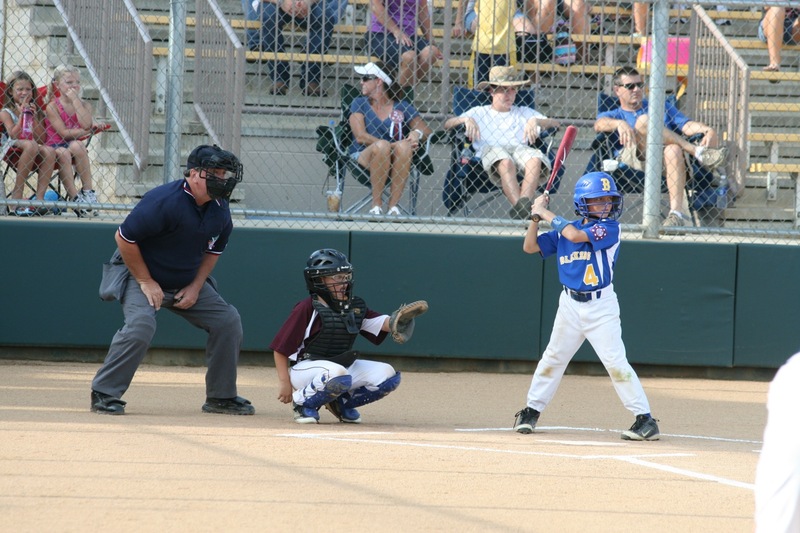 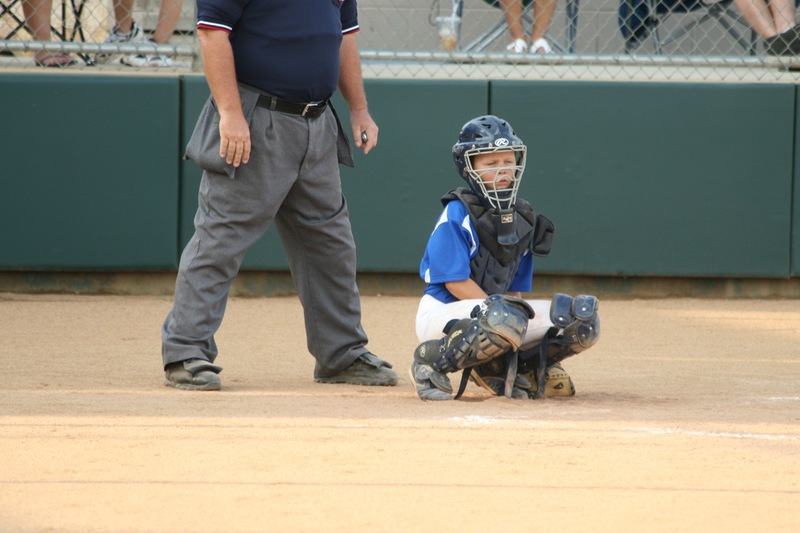 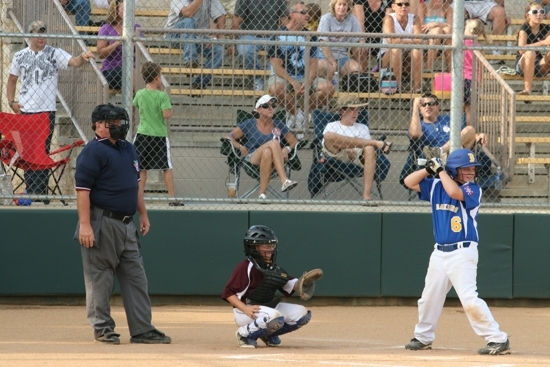 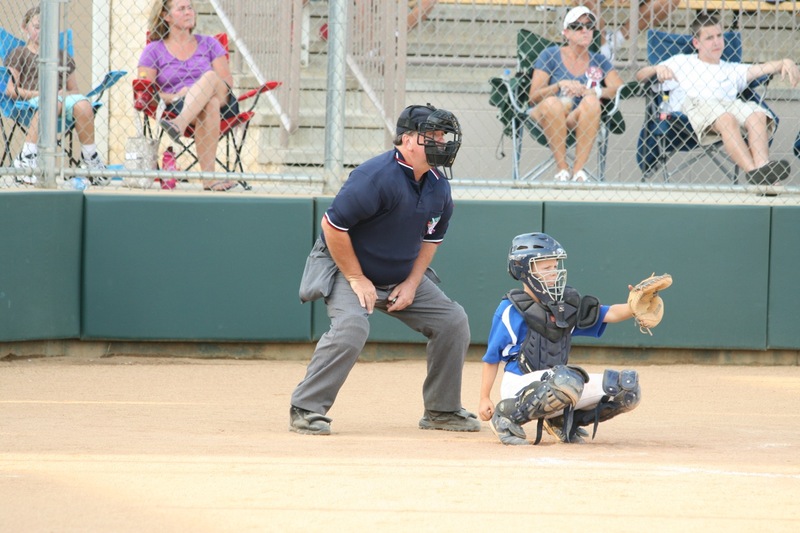 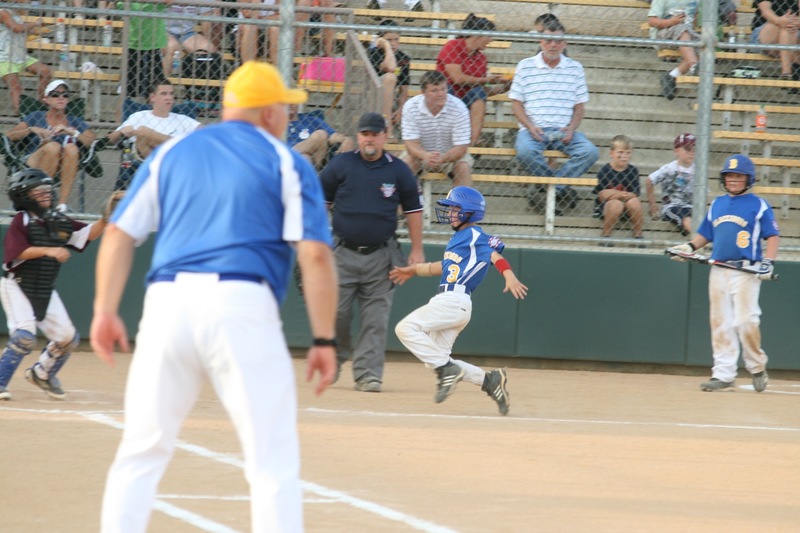 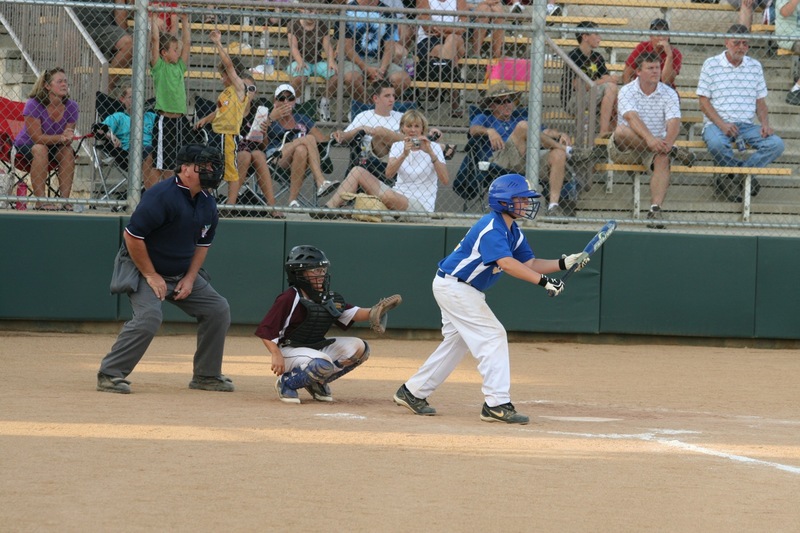 After six straight days of baseball in the area's intense heat, and teams running out of pitching, overall play suffered for some teams as the tournament progressed. 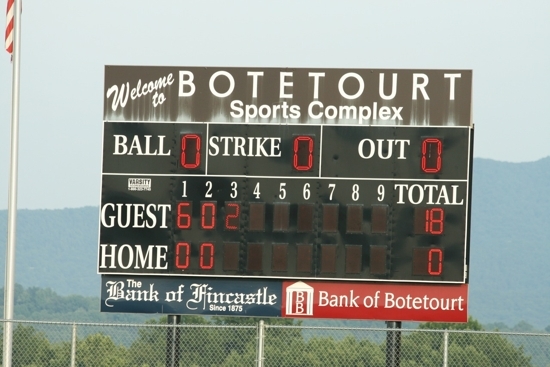 As the visiting team (determined by coin flip), Blacksburg wasted little time in putting runs on the board, scoring six runs in the top of the 1st...All with two outs. With one out, Ben Freel was HBP to get things started. Cole Epperley then drew a walk to put runners at 1st and 2nd. 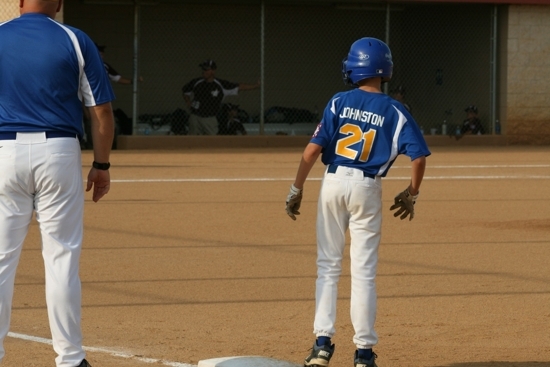 After a 2nd out, Davis Roberson walked to load the bases. 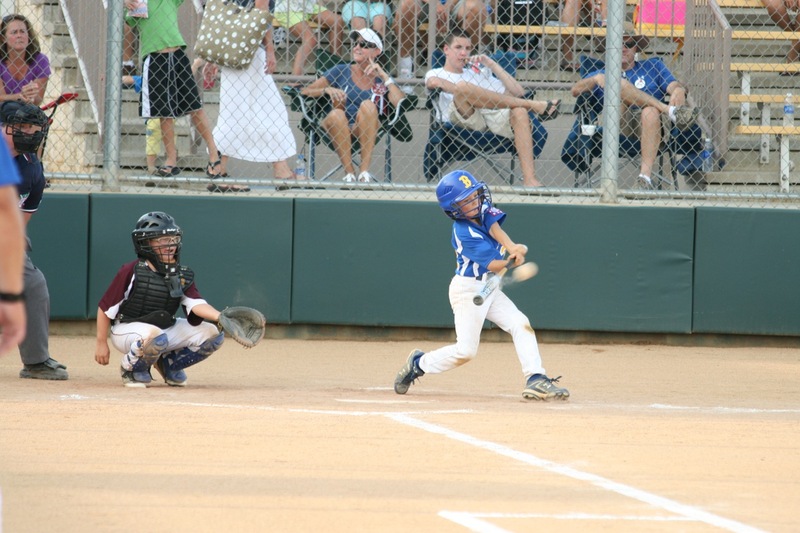 Jacob Lucas then hit a RBI single to put the first run on the board. 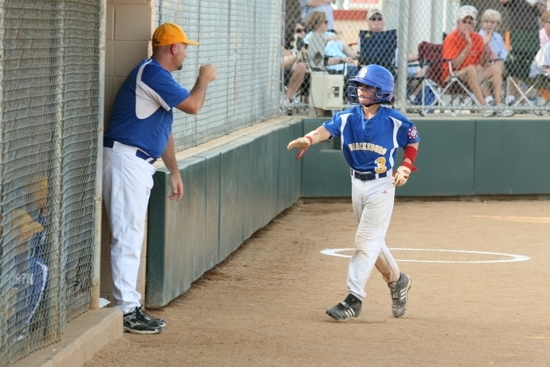 Grant Johnston was HBP and then Craig Weaver hit a FC that got by the SS. 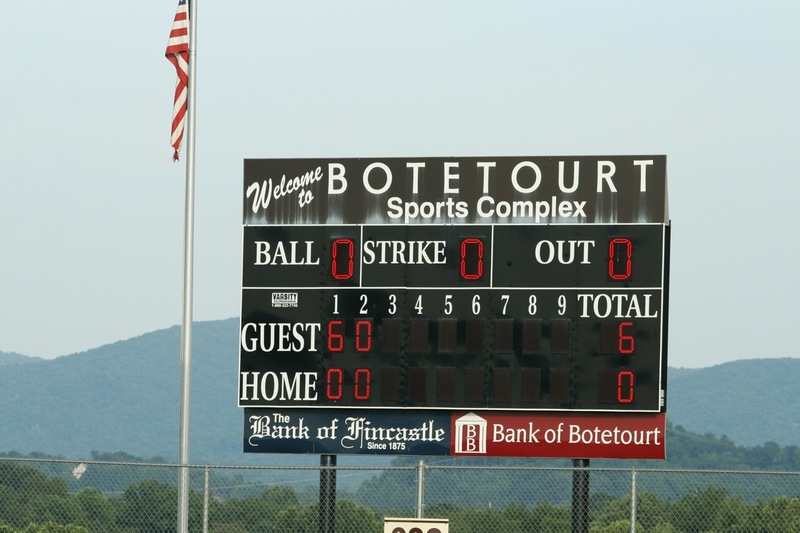 After a throwing error by a second Cavalier, all the bases were clear and Blacksburg was up 5-0. Weaver would advance on a passed ball, and the score on a wild pitch, to put Blacksburg up 6-0 after one half inning. 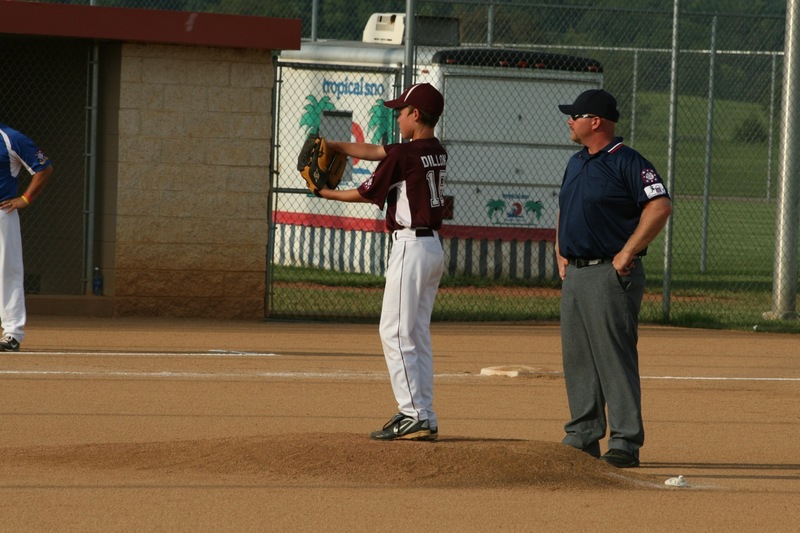 In the bottom of the 1st, starting pitcher Grant Johnston struck out the first batter. 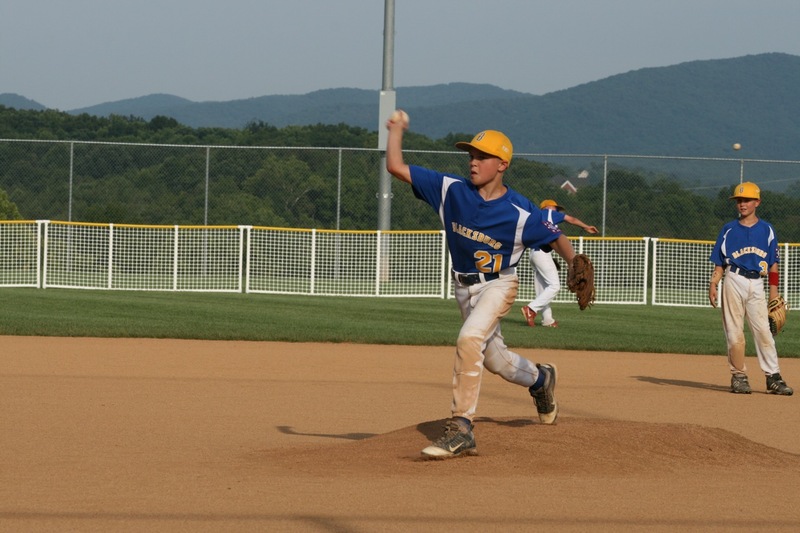 After a walk and a hit to put runners at 1st and 2nd, Johnston quickly ended the threat by striking out the next two Botetourt batters. 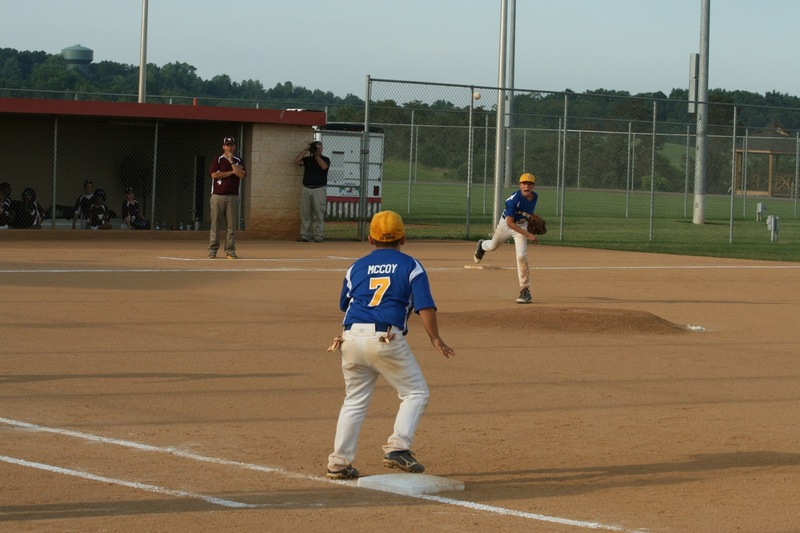 In the top of the 2nd, Blacksburg went three up and three down. 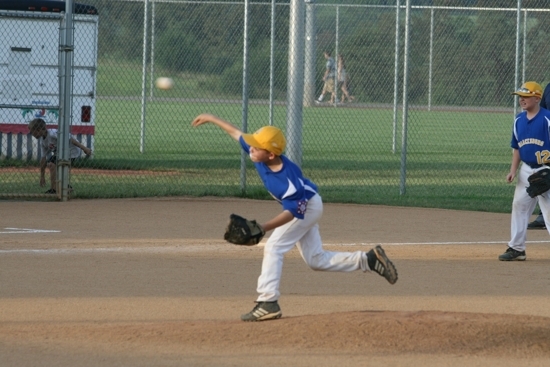 In the bottom of the 2nd, Johnston faced four batters, forcing three to hit into infield grounders. 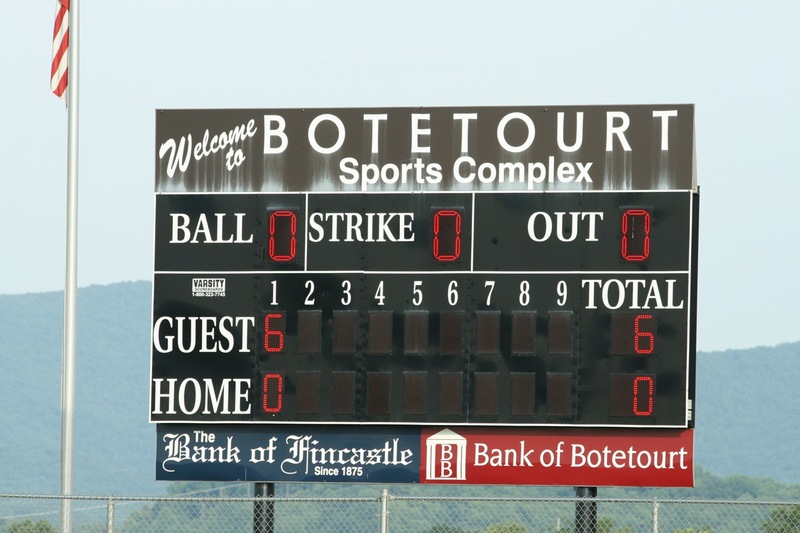 The fourth batter was HBP. 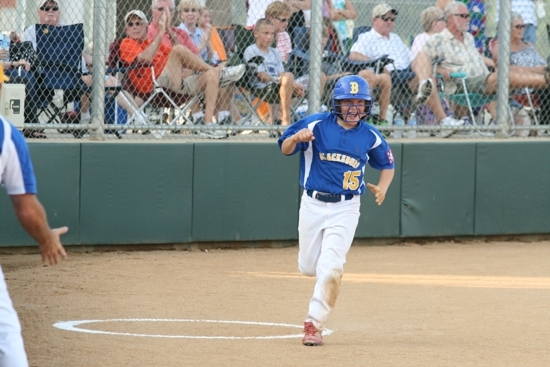 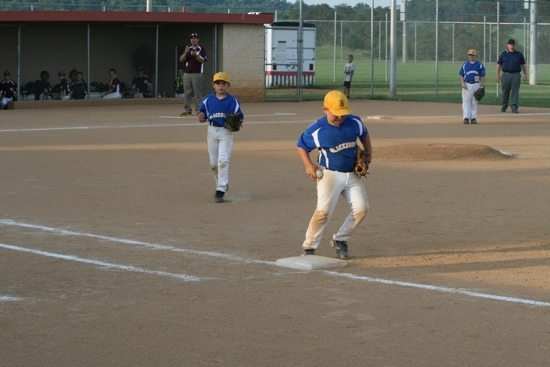 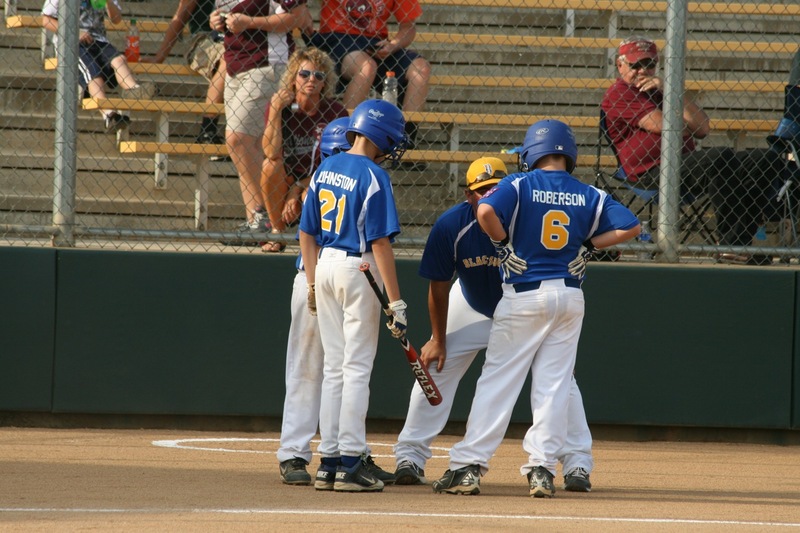 In the top of the 3rd inning, Blacksburg would explode for twelve runs and put the game away. Luke Goforth led off with a single and then stole second. Ben Freel drew a walk and Cole Epperley hit a hard single, scoring Goforth. 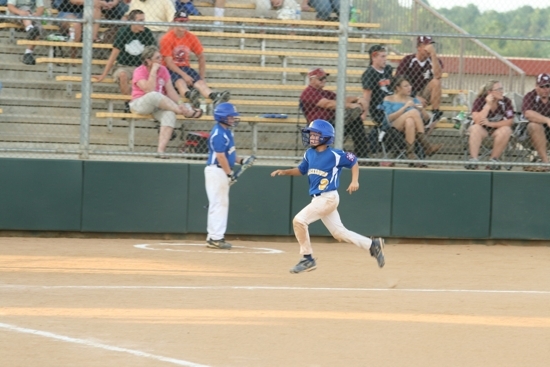 Wesley McCoy followed with a two RBI single to score Freel and Epperley. 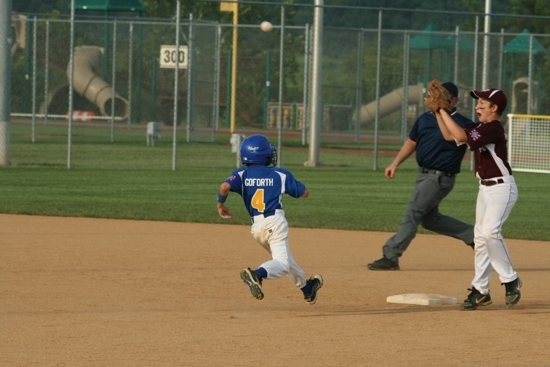 With McCoy on first, Davis Roberson drew a walk to put runners at 1st and 2nd. 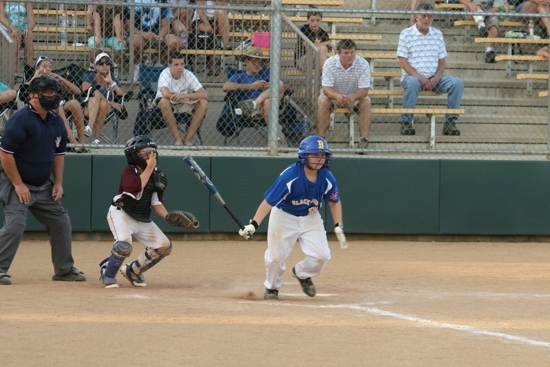 After an out, Grant Johnston hit a single to score McCoy. 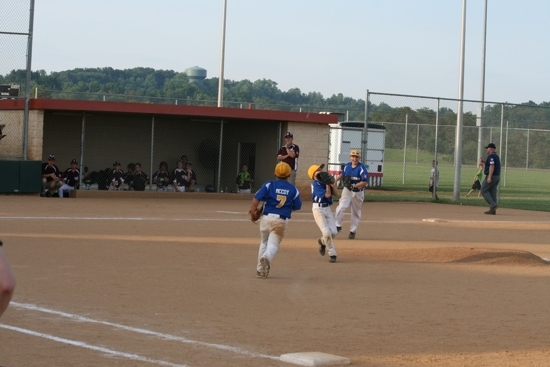 Craig Weaver then hit a single, followed by Cordell Croy reaching via an error, scoring Roberson. 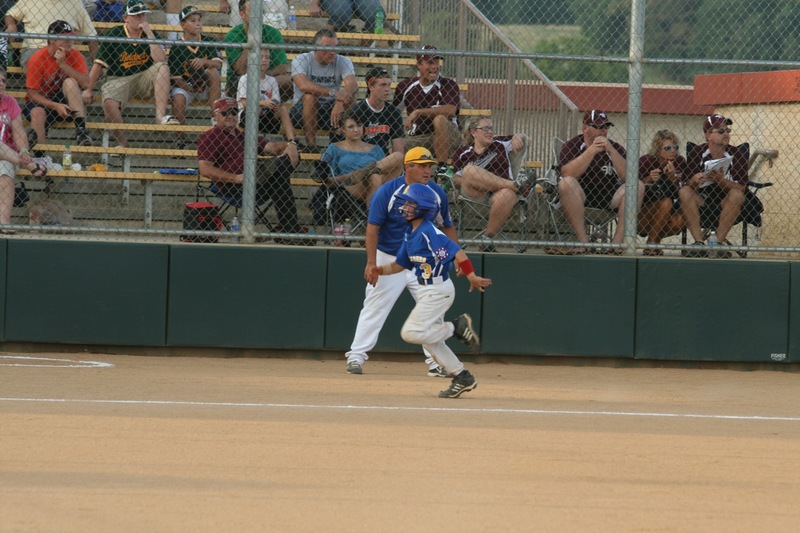 With bases loaded, Luke Goforth hit a FC, but a bobbled ball enabled him to beat out the throw and Johnston to score. 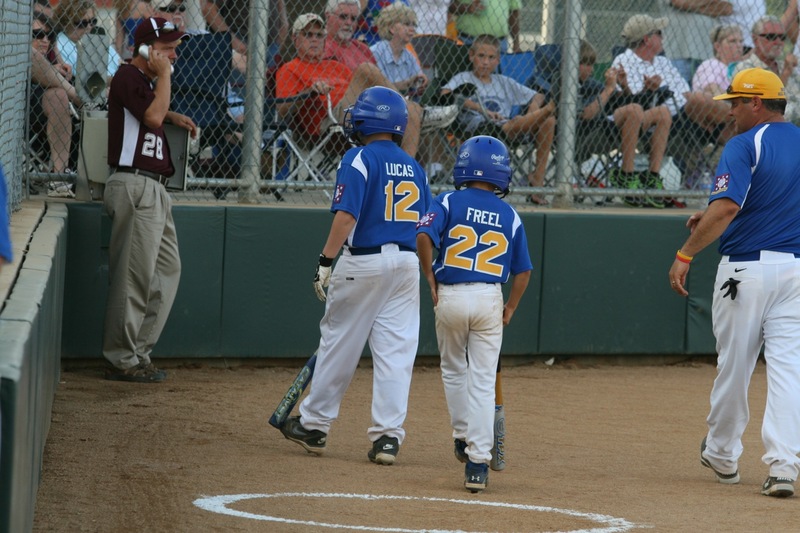 Ben Freel would draw his second walk to re-load the bases. 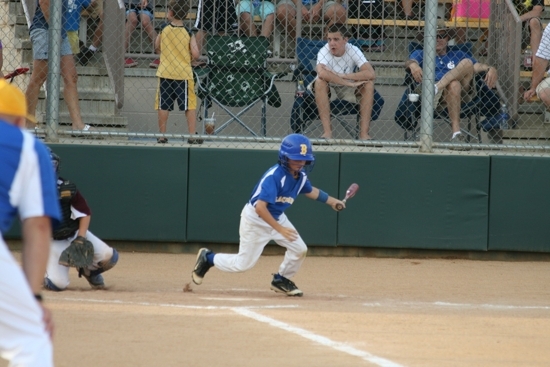 A single by Epperley scored Weaver. 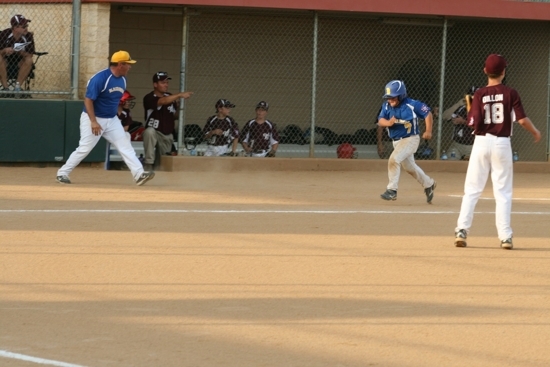 After a pitching change and bases re-loaded, Wesley McCoy and Davis Roberson drew RBI walks, scoring Croy and Goforth. 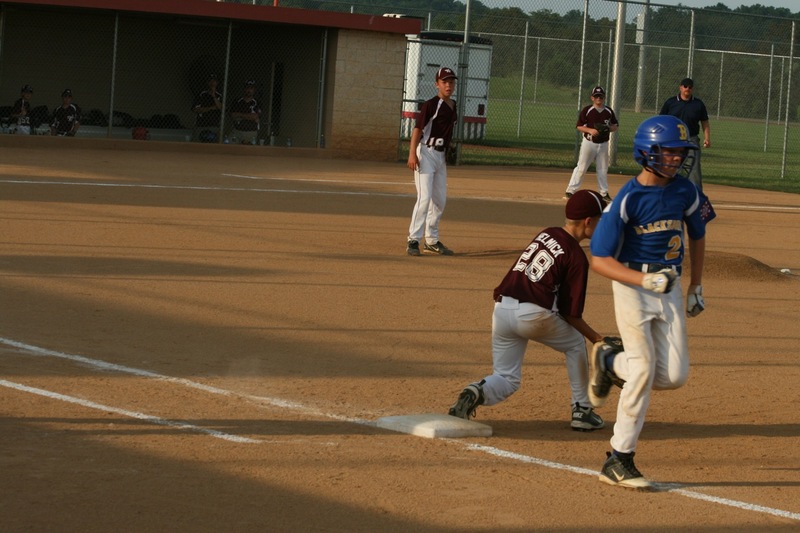 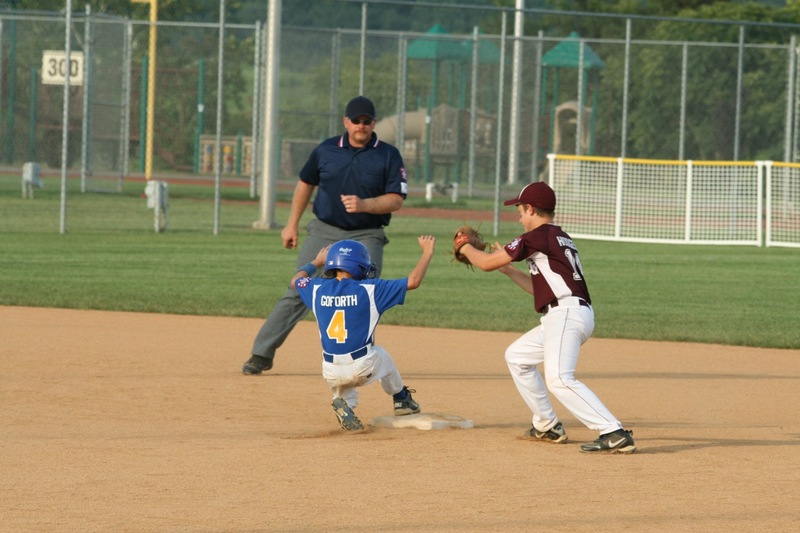 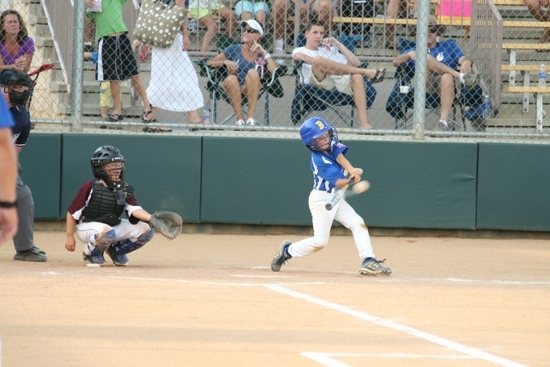 Jacob Lucas followed with a single to again re-load the bases. A errant pick play attempt to 3B, enabled McCoy to take home for the 12th run of the inning. 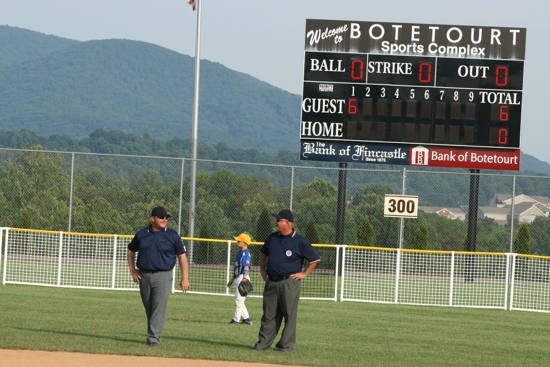 The inning ended by a very nice double play by Botetourt. In the bottom of the 3rd inning, Cordell Croy replaced Johnston on the mound. 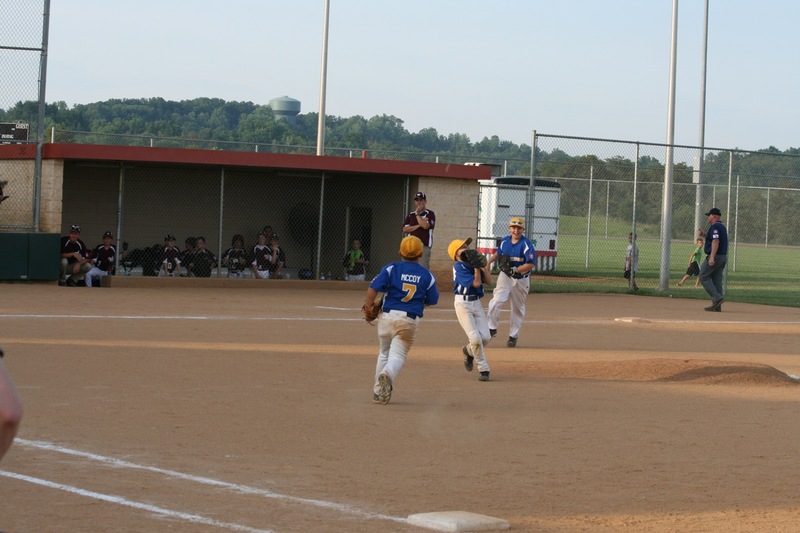 Croy quickly disposed of the Cavaliers by striking out the first batter, getting the 2nd to hit a ground ball to 1B McCoy, and then striking out the third batter to end the game. 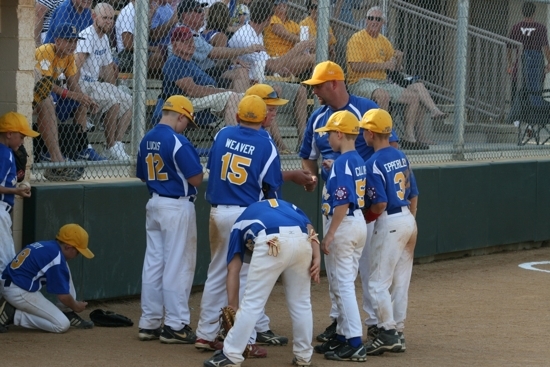 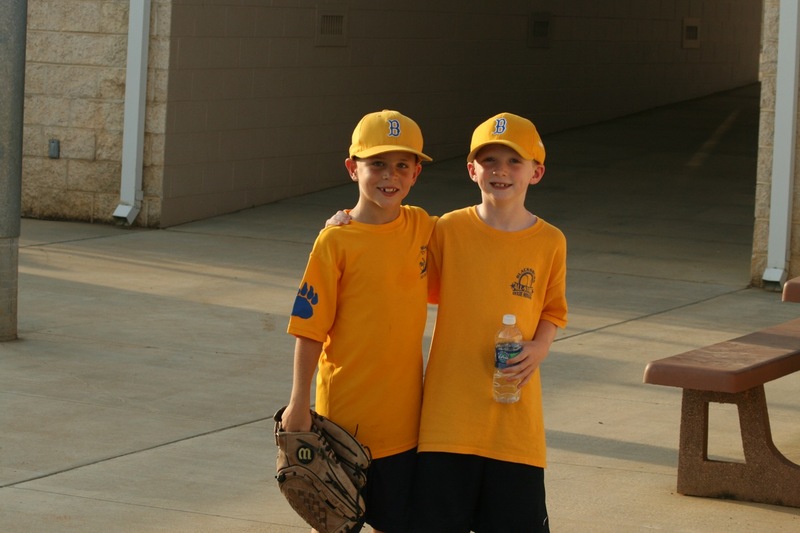 Johnston and Croy combined to throw a one hitter and faced only 12 batters. 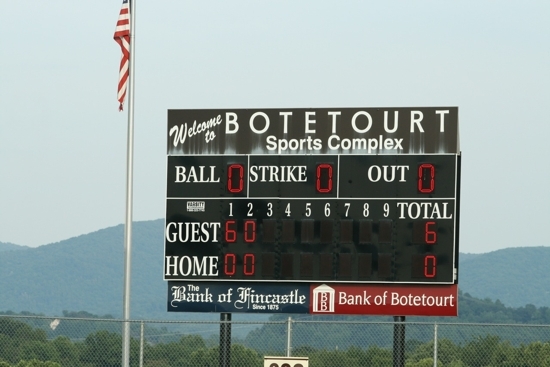 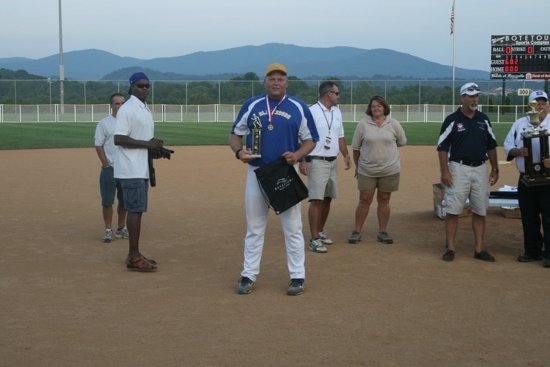 No Botetourt player batted more than once. 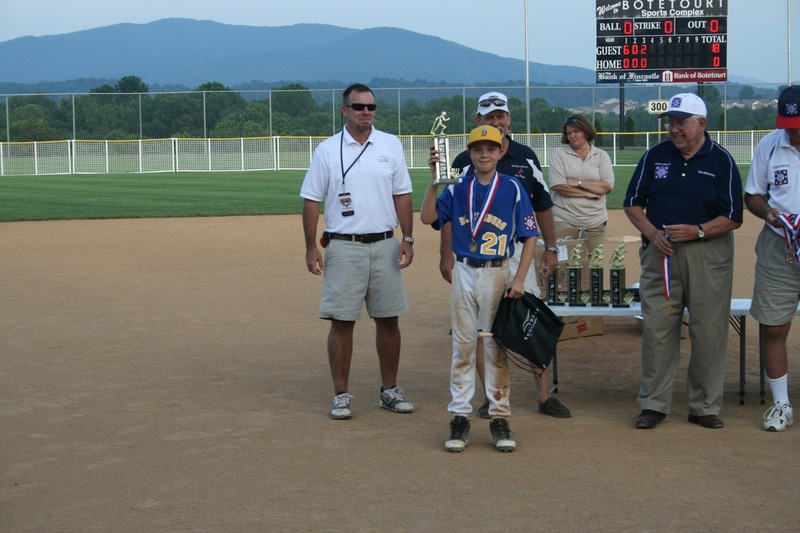 Offensively, Blacksburg was led by Cole Epperley who went 2/2 with 2 singles and drew a walk, to reach base all three times he was up. 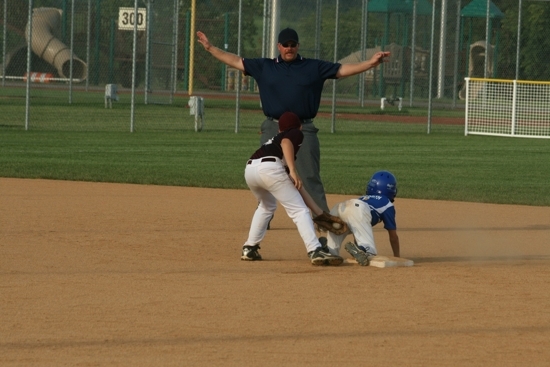 He also scored three runs and stole a base. 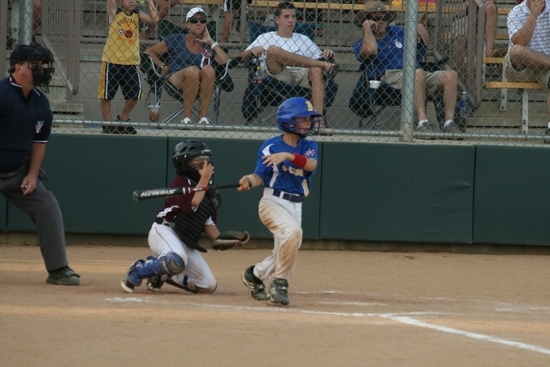 Jacob Lucas also had two singles, and scored two runs. 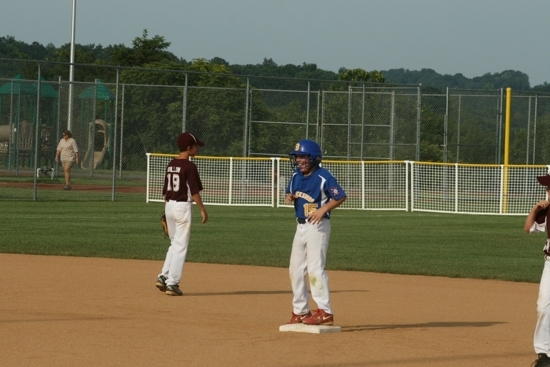 Wesley McCoy's 2 RBI single broke the game wide open in the 3rd. 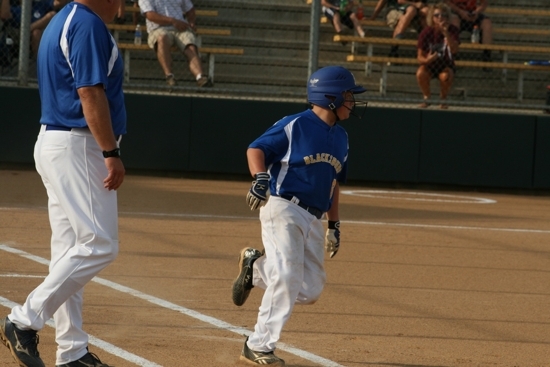 He also scored two runs. 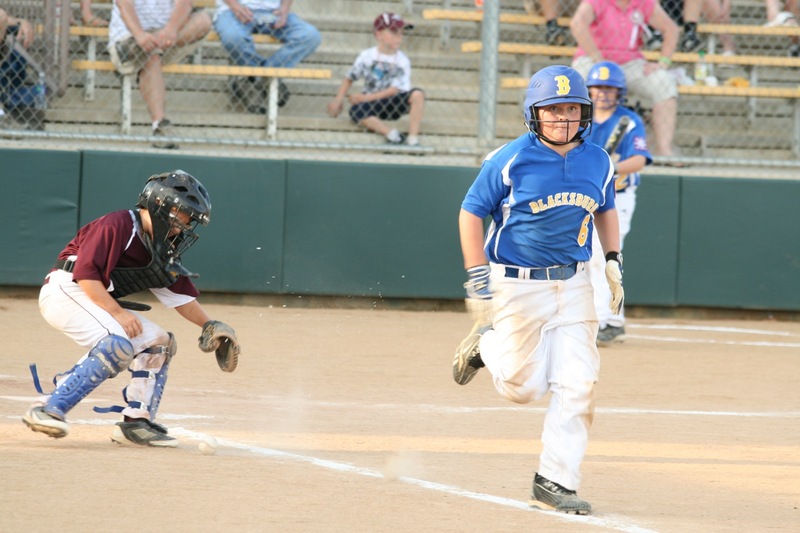 Ben Freel reached base all three times he was up and scored three runs, while Luke Goforth, Davis Roberson, Grant Johnston, and Craig Weaver each scored two runs. 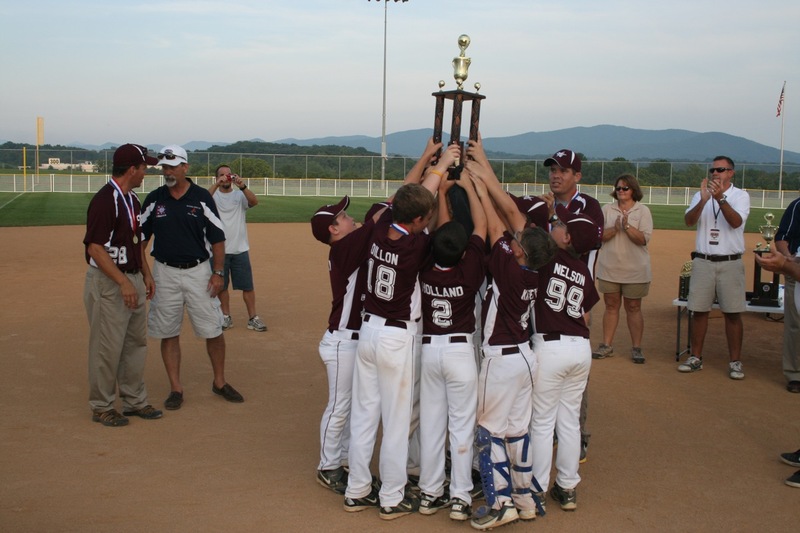 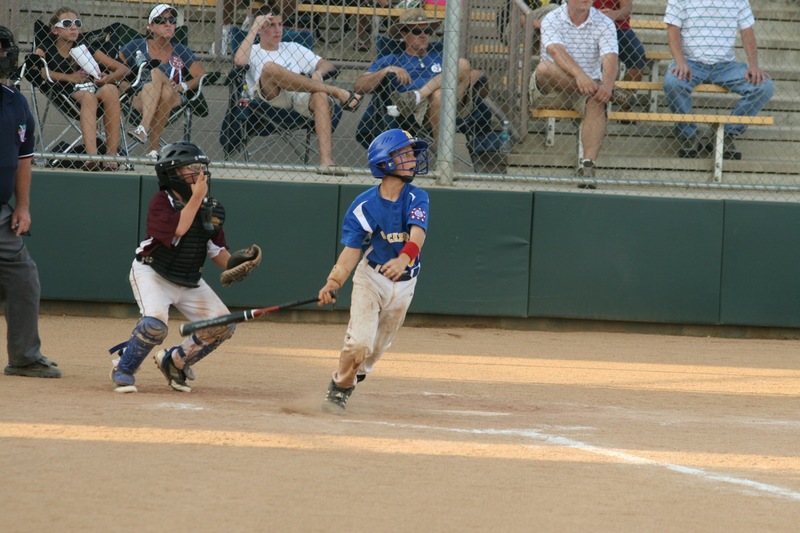 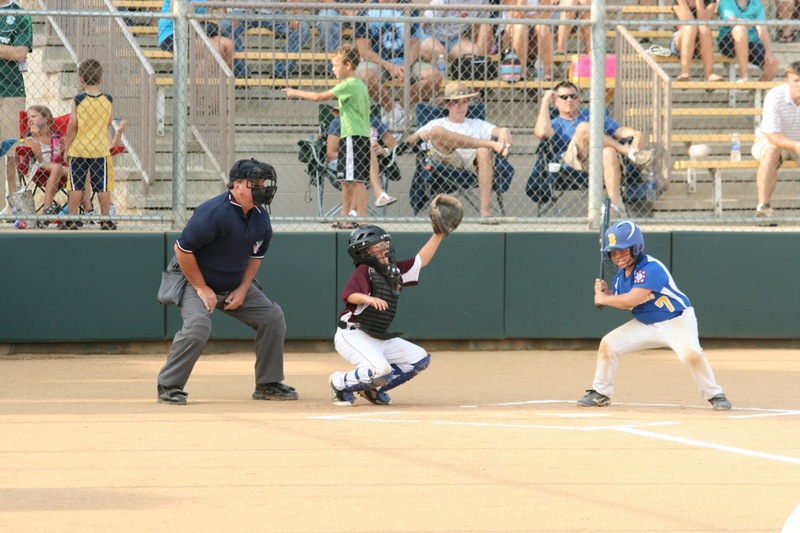 With the win, the Blacksburg Minors advance to the Dixie Youth World Series and will represent the entire State of Virginia. 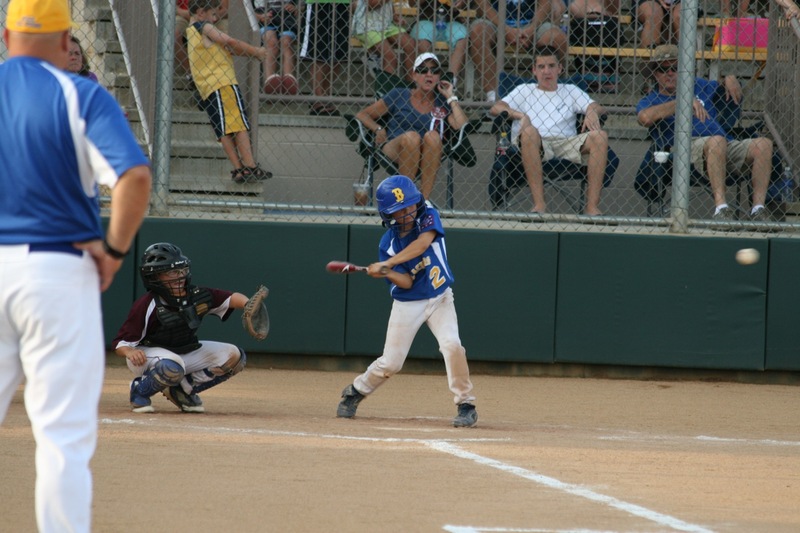 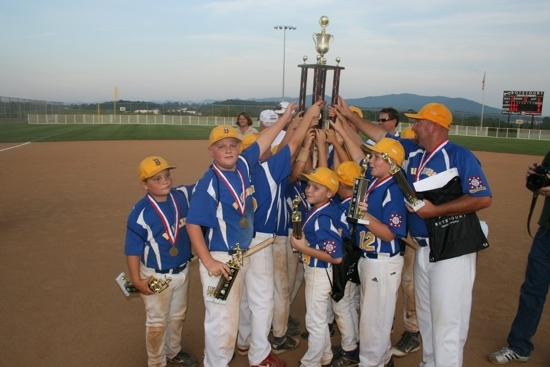 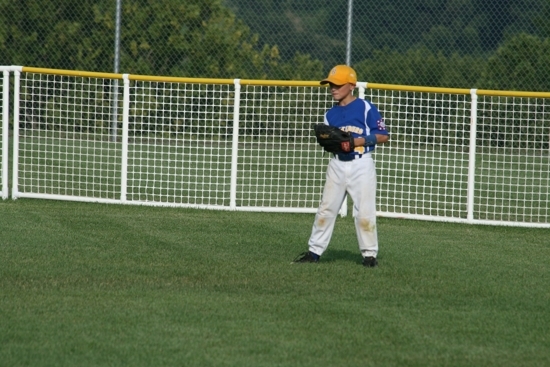 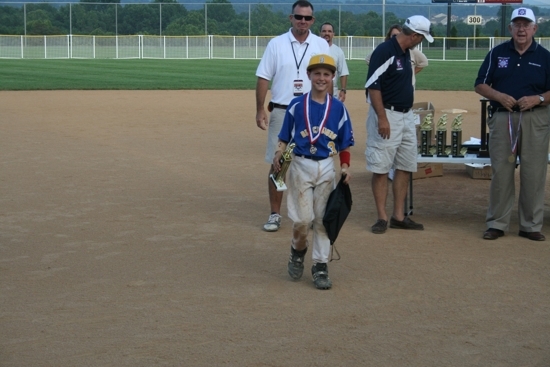 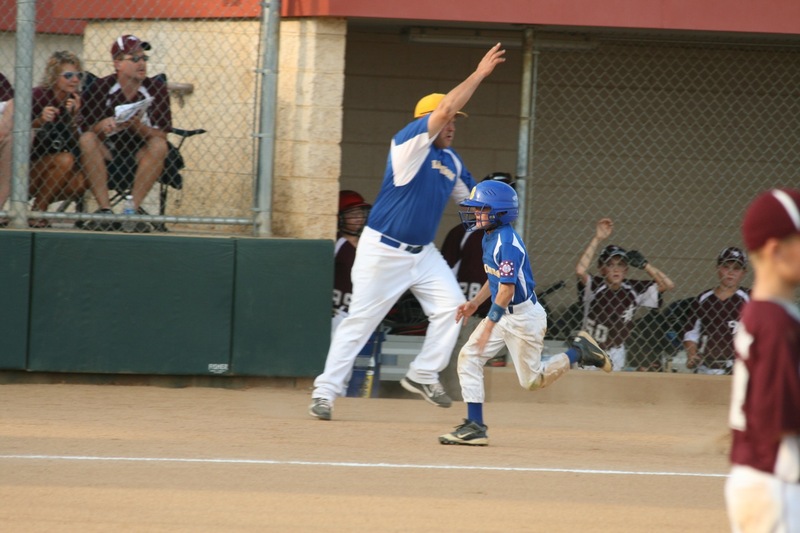 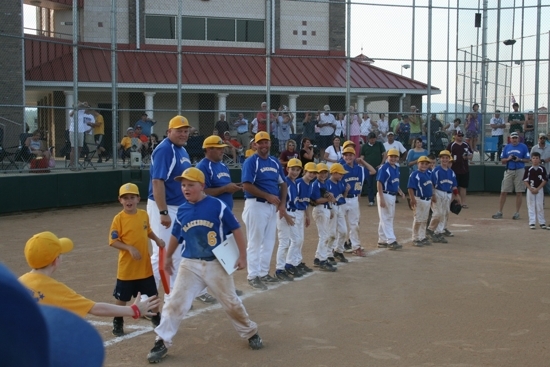 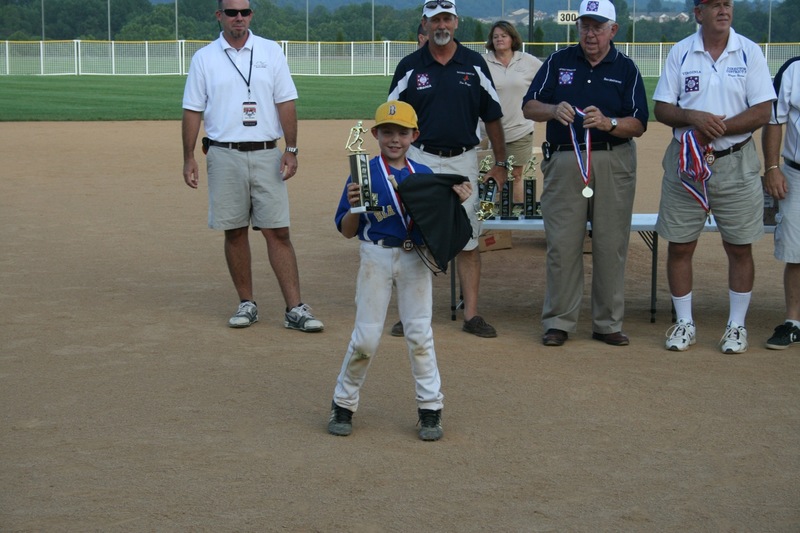 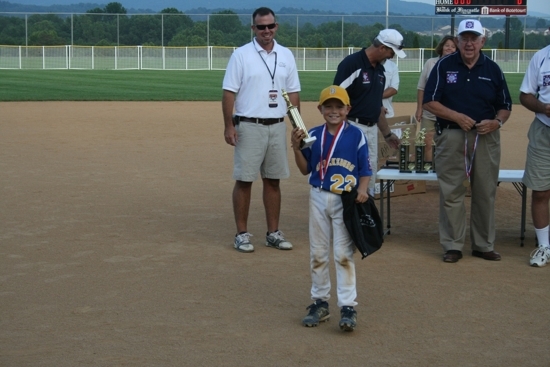 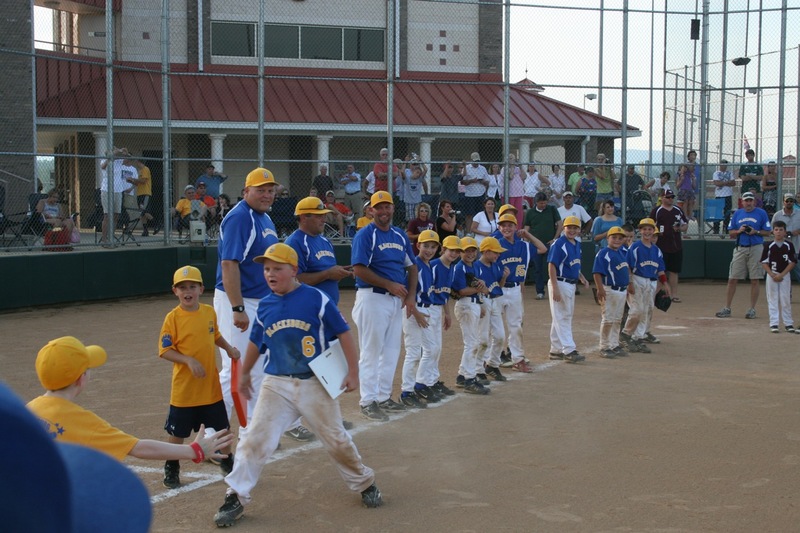 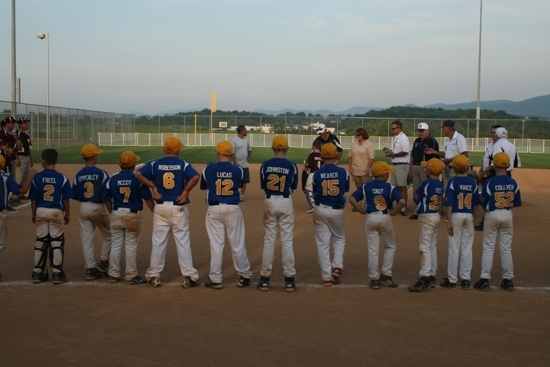 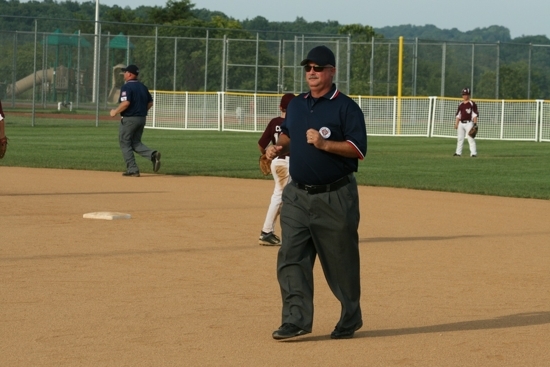 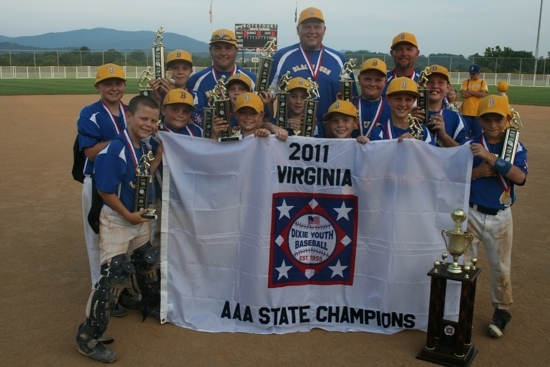 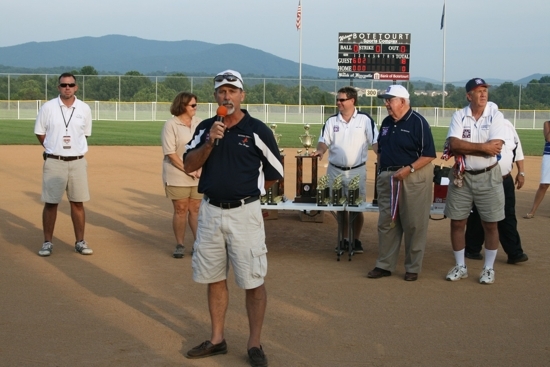 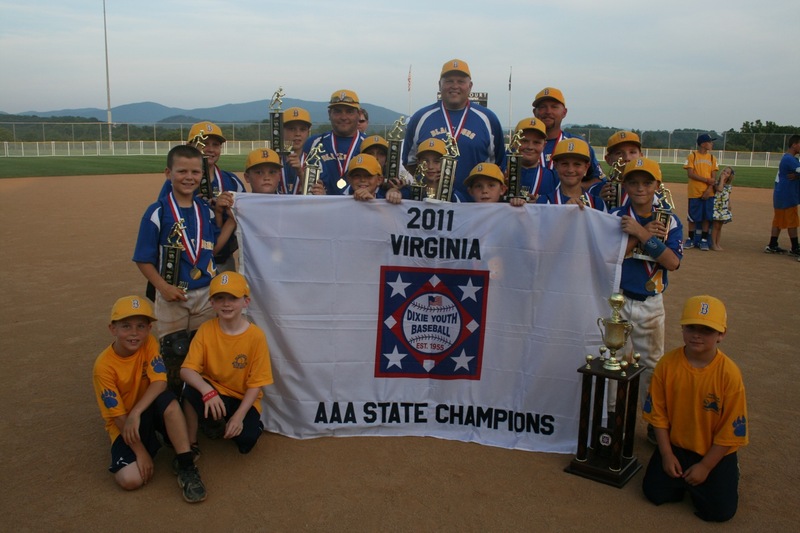 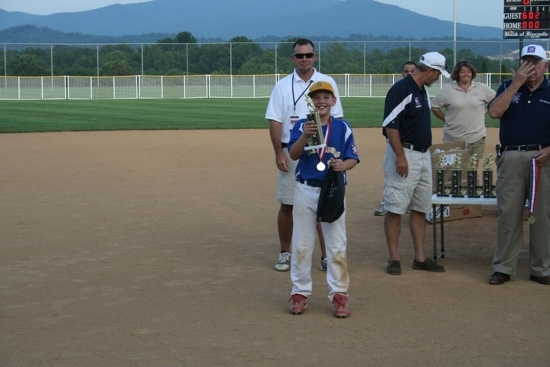 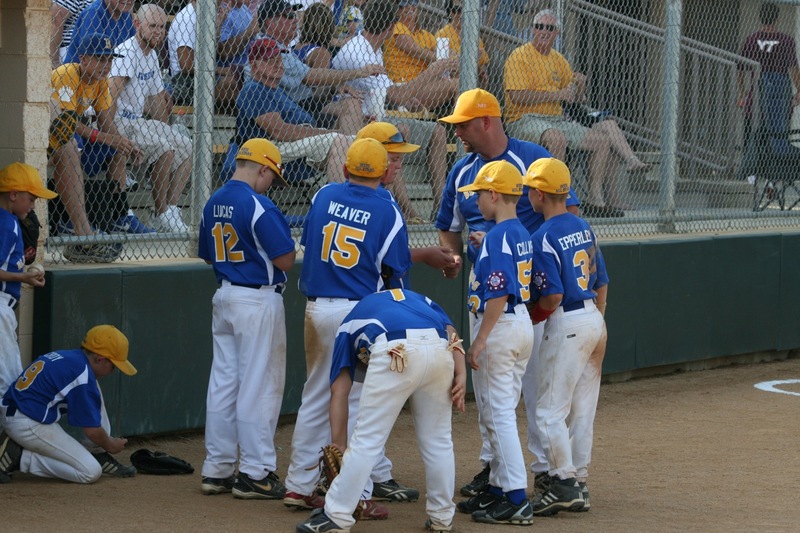 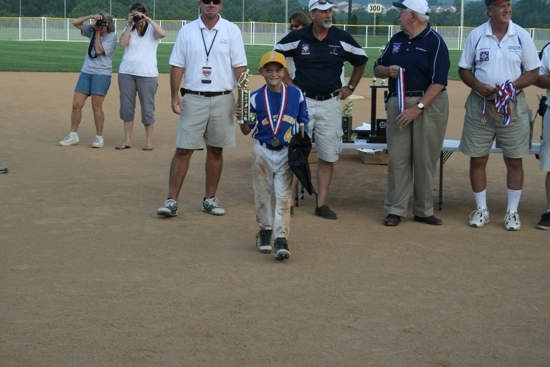 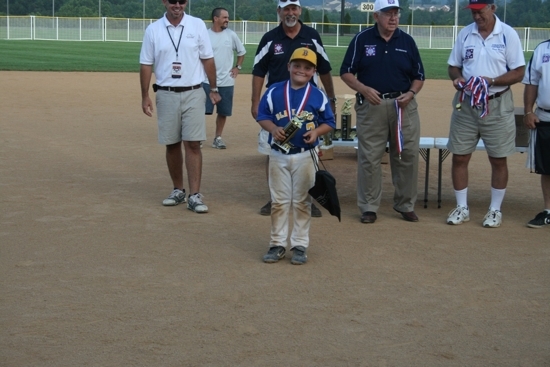 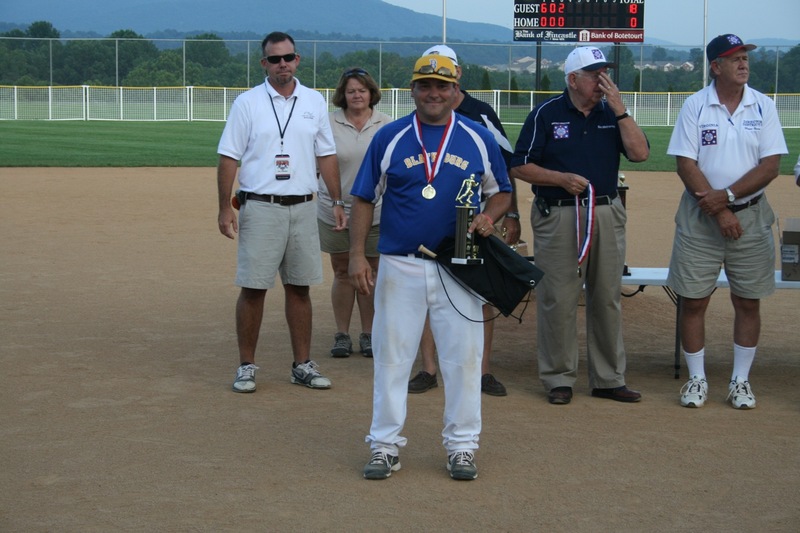 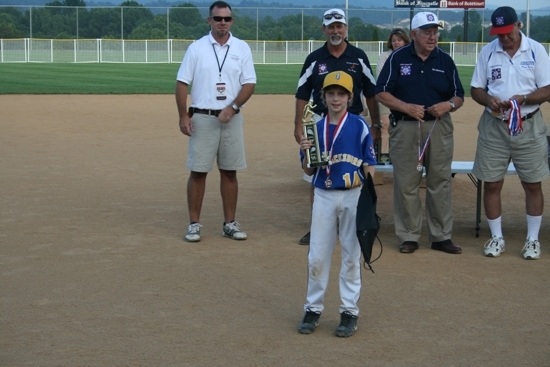 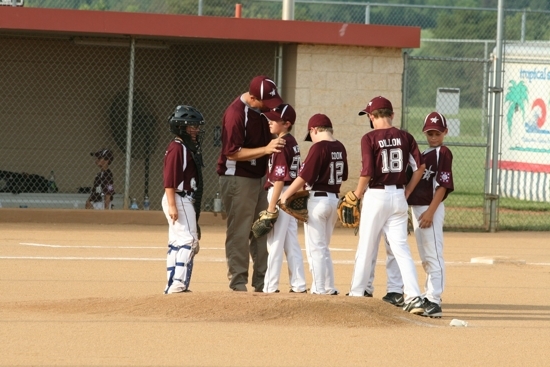 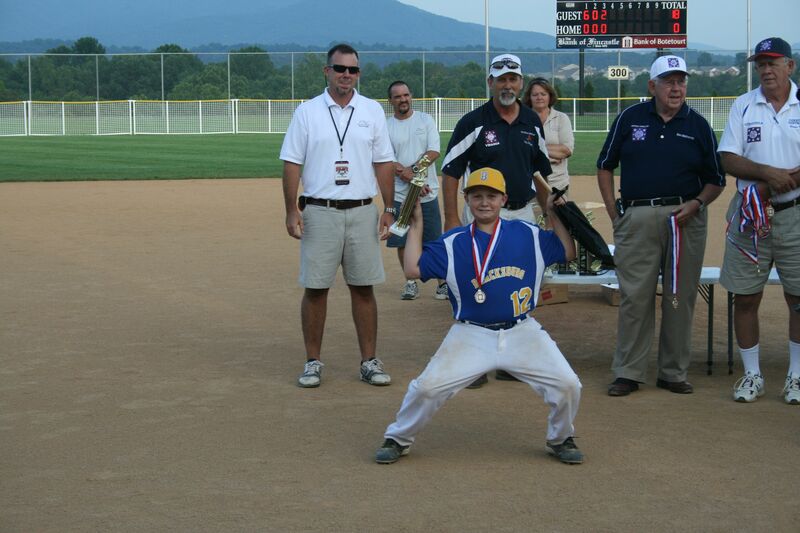 This will be the 2nd World Series appearance for Blacksburg Baseball; the first coming in 2007. With the five state tournament wins, Blacksburg is 14-5 in State Tournament play and is now the 3rd winningest franchise in Virginia State Tournament history (73%) and 2nd in # of overall wins. 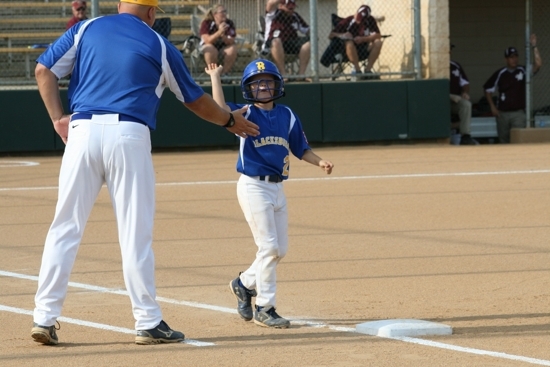 This year's State performance set several records, some are yet to be determined. A few thus far: 2nd all time in runs (66....Record is 70) and tied for most runs in a game (22). 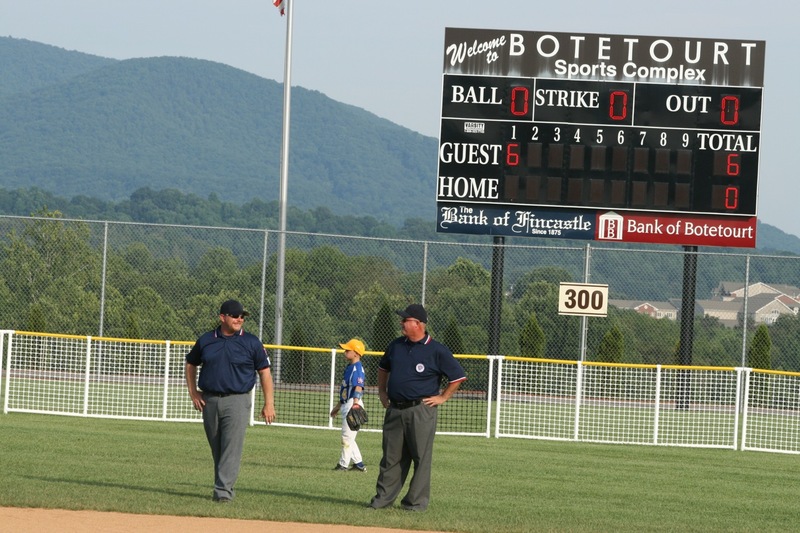 Waiting on final numbers, but Blacksburg will be at or near the top in RBI's, Hits, Stolen Bases, and Doubles...All for "tournament" and "game." Not bad for an organization founded just eleven years ago.